On April 17, 2009, Environmental Protection Agency Administrator Lisa Jackson signed proposed findings (Endangerment Finding) under the Clean Air Act relating to climate change.1 If finalized, the Endangerment Finding would lead to the first substantive regulation of greenhouse gases (GHGs) under the Clean Air Act (Act). This is a pivotal development in the federal regulation of sources of emissions that cause climate change. While the Endangerment Finding explicitly addressed only surface vehicles such as cars and trucks, the Environmental Protection Agency’s (EPA) action makes it more likely that the agency will also regulate aircraft and other sources of GHGs under the Act. There are already two petitions for regulation of GHGs from aircraft pending before the EPA. Perhaps more importantly, the Endangerment Finding puts more pressure on Congress to enact comprehensive climate change legislation, possibly including cap-and-trade proposals. Current legislative proposals on climate change could affect the availability and price of aviation fuels, affect standards for new aircraft engines and airframes, and subject some aviation facilities to cap-and-trade requirements. The Endangerment Finding also makes it more important that the Federal Aviation Administration address climate change issues in its environmental reviews under the National Environmental Policy Act. EPA has solicited public comment on its Endangerment Finding, providing a 60-day comment period that will commence with the finding’s publication in the Federal Register in late April or early May. EPA will make further opportunities for public comment available in later rulemaking processes that may address aviation specifically. In addition, climate legislation is in a critical formative stage in which a wide variety of stakeholder groups are seeking to affect the shape of the regulatory requirements. The Endangerment Finding has been in the making for more than a decade. In 1999, the International Center for Technology Assessment and 18 other entities petitioned the EPA to find that emissions of GHGs from motor vehicles endangered public health and welfare and to regulate them accordingly. Under the Act, the EPA has an obligation to regulate new motor vehicles and other sources of emissions that “cause or contribute to air pollution which may reasonably be anticipated to endanger public health or welfare.” E.g., 42 U.S.C. § 7521(a). As discussed below, the Act provides a nearly identical mandate for the control of emissions from new aircraft engines. Id. at § 7571. EPA denied the petition for rulemaking in August 2003. The agency found that it did not have authority under the Act to regulate GHGs to address global climate change, and that even if it did have the authority, it would be imprudent to do so. The Commonwealth of Massachusetts and a number of other parties immediately challenged the EPA’s denial of the rulemaking petition. “Under the clear terms of the [Act], EPA can avoid taking further action only if it determines that greenhouse gases do not contribute to climate change or if it provides some reasonable explanation as to why it cannot or will not exercise its discretion to determine whether they do.” Id. at 533. Scientific uncertainties do not excuse EPA from acting unless “the scientific uncertainty is so profound that it precludes EPA from making a reasoned judgment as to whether greenhouse gases contribute to global warming.” Id. at 534. The Court sent the matter back to EPA for further consideration consistent with the decision. The EPA sought additional public comment on the matter in July 2008, but did not make any decision during the previous Administration. The Endangerment Finding is the EPA’s proposed response to the Supreme Court after a period of more than two years. EPA “is proposing to find that greenhouse gases in the atmosphere endanger the public health and welfare of current and future generations.”3 Endangerment Finding at 1. “High atmospheric levels of GHGs are the unambiguous result of human emissions, and are very likely the cause of the observed increase in average temperatures and other climatic changes.” Id. The EPA also proposes to find that the combined emissions of these GHGs from new motor vehicles and new motor vehicle engines are contributing to the greenhouse gas “air pollution.” Thus, EPA would make all of the findings that are a prerequisite to regulation of GHG emissions from new motor vehicles and engines. However, the EPA did not propose such regulations in the Endangerment Finding. This will be done separately if and when the EPA finalizes the Endangerment Finding. The Endangerment Finding is critically important to aviation, because Section 231 of the Act contains a mandatory duty for EPA to “issue proposed emission standards applicable to the emission of any air pollutant from any class or classes of aircraft engines which in his judgment causes, or contributes to, air pollution which may reasonably be anticipated to endanger public health or welfare.” 42 U.S.C. § 7571(a)(2)(A). The Endangerment Finding makes all of the determinations that would trigger Section 231, except for the conclusion that aircraft engines cause or contribute to the GHG air pollution. This is not simply a hypothetical matter: in December 2007, States, other local governments and environmental groups petitioned the EPA to regulate aviation-related emissions under Section 231.4 These petitioners sought an extensive array of regulatory actions from EPA, including GHG emissions standards from new aircraft and engines, airspace modernization, single-engine taxi requirements and mandatory ground power and preconditioned air at gates. EPA has not yet acted on these petitions and has been waiting to address the more general endangerment questions. Water vapor may be an issue of concern when it is emitted by aircraft at high altitudes, where, under certain conditions, it can lead to the formation of condensation trails, referred to as contrails...EPA has received a petition under the Act to consider the regulation of aircraft emissions (water vapor and NOx) that lead to formation of contrails (in addition to aircraft greenhouse gas emissions), and EPA plans to evaluate this issue further. At this time, the Administrator is not proposing to include aircraft-related contrails or emissions that are not greenhouse gases within the definition of air pollution for purposes of section 202(a). 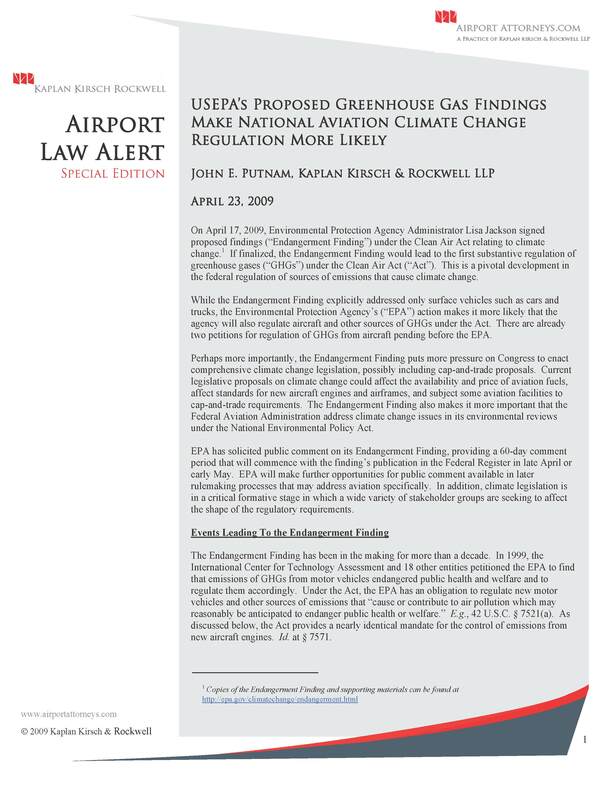 The Endangerment Finding did not identify any specific threshold that would indicate how EPA would approach the contribution of aviation to global GHGs under Section 231. Obviously, the contribution of motor vehicles as a class to national or global GHGs is much higher than aviation. Nonetheless, the Endangerment Finding suggests that it is likely to find that source categories like aviation “contribute to” GHG air pollution if they are non-trivial sources. Because aviation contributes approximately three percent of global GHGs, EPA would probably find that it contributes meaningfully to GHG air pollution, triggering the requirement for Section 231 regulation. EPA would then need to address the difficult and complicated questions of the extent of its regulatory authority (e.g., how far it can regulate beyond new engine standards) and the feasibility or safety of potential regulatory options. EPA action on aviation may prove unnecessary if Congress acts by passing comprehensive climate change regulation that supersedes the existing provisions of the Act. The Act was designed to address regional and local pollutants such as ozone and carbon monoxide, not global issues like climate change that implicate the entire global economy and environment. The Act’s provisions are not well suited to addressing the climate change issue, even if the terms of the Act may compel EPA to do so. As a result, Administrator Jackson and other members of the Administration have pushed Congress to act on comprehensive climate legislation. The in terrorem effect of impending climate regulation of a wide variety of sources is designed to put more pressure on Congress to act. The House is holding hearings this week on draft legislation from Representatives Waxman and Markey, called the American Clean Energy and Security Act of 2009 (ACES).5 In its current form, ACES would affect aviation in a number of ways. For example, it would subject providers of aviation fuel to both a mandatory low-carbon fuel standard and a cap-and-trade regulatory system that would include jet fuel. The cap-and-trade system would also apply to large stationary combustion facilities operated by airports and manufacturers, such as heating plants. In addition, the Bill proposes to require the EPA to impose GHG emissions standards on new aircraft engines by the end of 2012. While it is unclear whether ACES or other climate legislation can muster the 60 votes necessary to break a filibuster in the Senate this Session, it appears more likely that aviation will face some form of mandatory regulation through regulation or legislation in the coming few years. The scope and burden of such regulation will probably depend on consistency, helpfulness and compelling content of input from the aviation sector, in the context of the heavy lobbying on climate issues from other industry sectors. The Endangerment Finding brings federal regulation of emissions from the aviation sector closer. It behooves aviation stakeholders to develop and articulate consistent positions regarding whether and how aviation should fit within a regulatory or legislative program for climate change. Other industry sectors are certainly doing so in an aggressive fashion. Failure to do so may result in aviation taking a disproportionate share of the burden of future regulations. Airports in particular should develop consistent and coherent messages and deliver them individually (through agency comments and communication with their own Representatives and Senators) and collectively (e.g., through Airports Council International-North America and/or the American Association of Airport Executives). Because the Endangerment Findings explicitly relate only to motor vehicles, it is not essential that airports and other aviation interests comment in this process. However, aviation stakeholders may want to comment on the Endangerment Finding to begin staking out a position on how aviation should be treated under the Act. Further, stakeholders should prepare now for the regulatory processes that are likely to follow the Endangerment Finding. They should also engage in the legislative process that has already started. 1 Copies of the Endangerment Finding and supporting materials can be found at http://epa.gov/climatechange/endangerment.html. 2 For a copy of the Massachusetts case, see http://www.airportattorneys.com/files/MassVEPA.pdf. 3 EPA proposes to define six GHGs as air pollution for purposes of the Endangerment Finding: carbon dioxide, methane, nitrous oxide, hydrofluorocarbons, perfluorocarbons, and sulfur hexafluoride. 4 Copies of these petitions can be found at: http://www.airportattorneys.com/files/AircraftPetition.pdf, http://www.airportattorneys.com/files/AircraftGHGPetition.pdf. 5 A copy of the discussion draft of ACES can be found at http://www.airportattorneys.com/files/acesa_summary.pdf. A PDF of this Special Alert is available.